ST. EUSTATIUS, SABA - Airline Caribbean Netherlands (CN) Express will take off on its final flight connecting Bonaire with St. Eustatius and Saba on Friday, June 29. 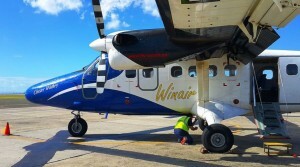 The air connection void will be filled by Windward Islands Airways International Winair as of July 1. As of July 1, Winair will operate flights between Curaçao and St. Maarten seven times a week, to Bonaire four times a week and to Aruba three times a week. Due to the new air link, it is no longer necessary to maintain the CN Express connection with the Dutch Windward Islands. The temporary air connection via CN Express has been operational for a month longer than the Dutch Government had initially planned. CN-Express was established via a collaboration of the Dutch Ministries of the Interior and Kingdom Relations (BZK) and Infrastructure and Water Management IenW. After hurricanes Irma and Maria in September 2017, there was need for extra accessibility to the Windward Islands. The ministries joined forces and by the end of February CN-Express was launched for three months.